Kiefer Sutherland is the reason the show 24 was a hit in the first place, so the news of the show having another comeback but without Jack Bauer makes zero sense. E! was the first to report the big news on the hit Fox show’s big return. This was the best news I had seen in days! The network gave a little insight into their plans. The latest version will be called, 24: Legacy but will have an entirely new cast. This is where my joy turned into tears. Well that’s nice. But what about Jack Bauer? 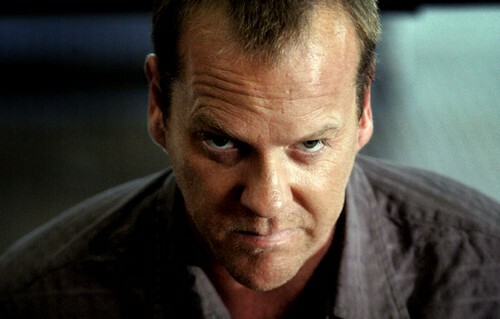 How can the show go on without Kiefer Sutherland leading the way? It looks like he will be… behind the scenes though. Fox is keeping some of the original team in tact to produce the show. This will include Kiefer Sutherland, Howard Gordon, Manny Coto and Evan Katz as executive producers. Well thank goodness! At least we can take comfort in the fact the Jack Bauer, er uh, Kiefer Sutherland is still involved… so we will still get the good vibes only he could send out into the heart pounding episodes that we can never get enough of. Fox has also revealed a bit on the upcoming pilot’s plot for 24: Legacy. It will be more military based, with a main character that is a military hero who comes home to the States and ”the trouble that follows him back.” This will of course bring in CTU and terrorist attacks and all the sweaty palm works that we thrive on while glued to the TV screen. This is obviously not going to be the same 24 as the originals. But, it is definitely better than nothing. Remakes can sometimes give originals a run for their money. Sometimes. It’s just awesome that we have a 24 of any kind to look forward to. What do you guys think? Are you devastated that we won’t get another season with Jack Bauer? You’re still going to watch the show, right? Stay tuned for the latest updates on 24: Legacy here at CDL!